All of Greece goes home for the holiday. All over Greece, rooms are hard to find, tickets on ferries and hydrofoils almost impossible to get, buses and trains are on modified schedules, and fasting Greeks are spending two weeks in reverential deprivation to prepare for the Feast of the Dormition (also called Assumption) on August 15th. This date in the Greek Orthodox calendar marks the moment when the devout believe that Mary, the Theotokos, ascended into Heaven. It's traditional to return to home villages, so even remote locations are busier than usual as the Greeks of the diaspora return to their homeland to connect with family, visit friends, and immerse themselves in the ancient rituals, culture, and practice of being Greek Orthodox. The Koimisis tis Theotokou, Dormition of the Virgin Mary, or Assumption of the Virgin Mary all are names referring to the feast commemorating what is believed to be the miraculous transport of Mary, in bodily form, to Heaven after her death. Some accounts claim that she died in Jerusalem; others put her death in the Graeco-Roman city of Ephesus, now in Turkey, and the site of an alleged "House of the Virgin Mary." The Ephesian origin is plausible as it was the Council of Ephesus which first proclaimed the feast. The story itself does not appear in the Bible, but is found in apocryphal stories and folklore, with written records dating back to as early as the third century. Accounts of the story differ, but here are the basic details. Saint Thomas, who had been preaching in far-off India, found himself swept up in a swirling cloud which took him to a spot in the air above her tomb, where he witnessed her ascent. He asked her where she was going; in answer, she tossed her girdle to him. 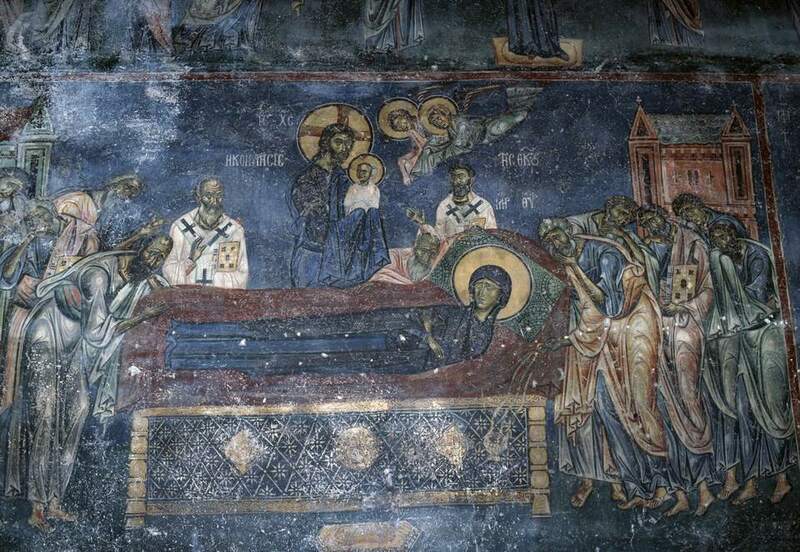 Thomas ultimately landed near the tomb, where he met the other surviving apostles. He begged them to let him see her body so that he could say goodbye, and that's when it was discovered that she had left the earth in body and in spirit, to intercede on the behalf of the faithful. The apostles found her clothes left behind in the tomb, where it was said that they emanated a wonderful fragrance, a true "odor of sanctity." Churches throughout the country celebrate the feast with traditions which vary from place to place. Rural churches are jammed with not only worshippers, but offerings in the form of animals, property, and food; some churches even hold an auction of these offerings during the celebrations, though this custom -and livestock offerings- are less common today. Greeks of the Orthodox faith prepare themselves by fourteen days of fasting, from August 1st to the 14th, a fast which is joyfully broken on the 15th. The frenzied travel home that many Greeks undertake is also a kind of pilgrimage, to family, culture, faith, and country. It's a rich and wonderful, if crowded, time to be in Greece. What Do Sardines and Brides Have to Do with St. Anthony in Portugal? Who Was the Mary from Dungloe They Sing About so Much?